Take your First Step in Travel with our Cloudz Compact Travel Backpack! Extremely durable made with tough 190 Denier, this pack is perfect for traveling or everyday use. This full size backpack was designed to fold into its own case when not in use to save valuable space when traveling, when storing at home or in your car. This bag comes with ample storage space, accessibility, and convenience. There is a large main zipper compartment for your larger items, two exterior zipper pockets in the front for your smaller items, two mesh side pockets for your water bottles, a top carry handle and adjustable shoulder straps for comfort. Our Cloudz Travel Backpack is also water resistant and clips to luggage for easy transport. 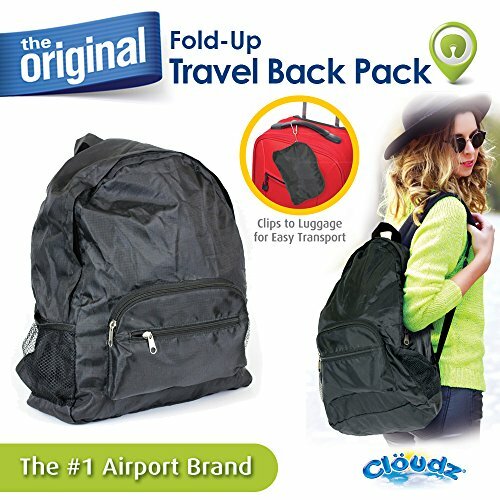 The Cloudz Full Size Backpack is Perfect for Travel! So Compact it Folds into it's Own Travel Case. Includes Adjustable Shoulder Straps and a Top Carry Handle.